Only very few antennae organize such a professional Summer University as AEGEE-Aachen. The antenna with the polar bears mascot is famous for its amazing German language courses and its hospitable and crazy spirit. 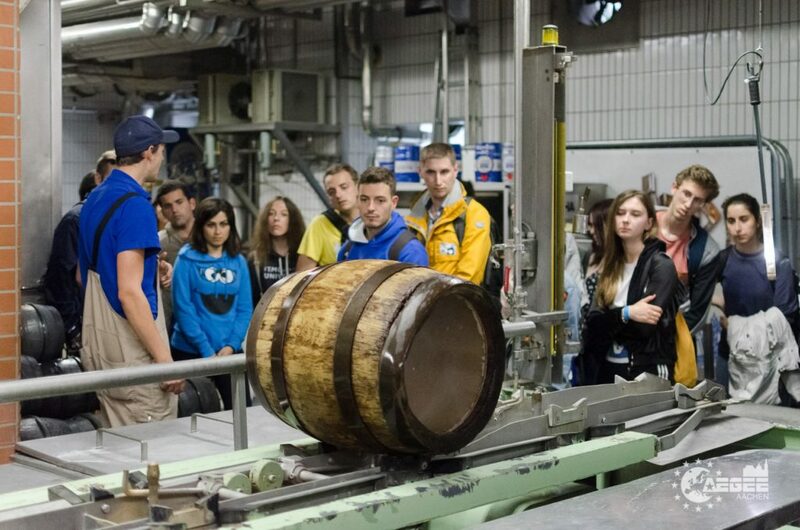 In short: The Summer University of AEGEE-Aachen is the perfect mix of learning and having fun. 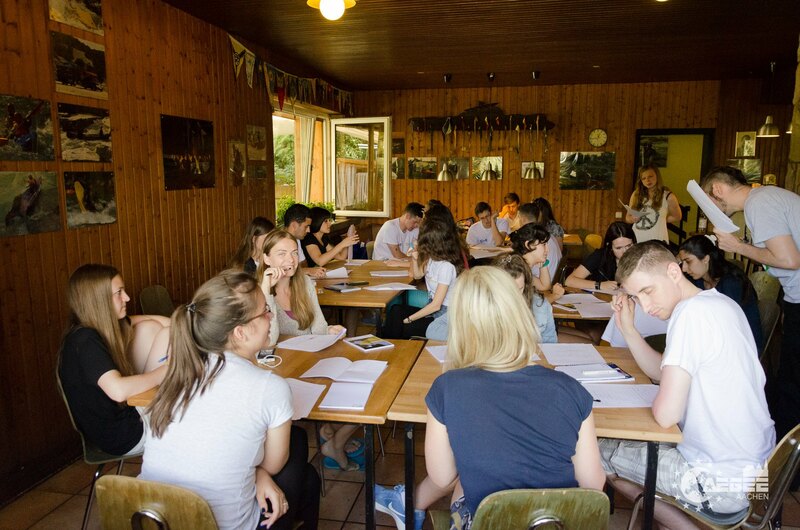 Also the participants of last year’s course agreed: they gave the event such a great score that it became the third-highest rated Summer University among more than 60 courses! 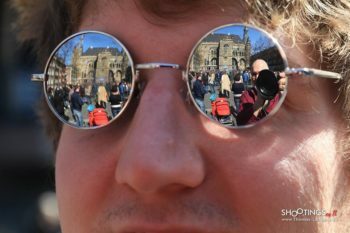 Felix Goeke, main organizer of last year’s SU told the Golden Times why it was so perfect. 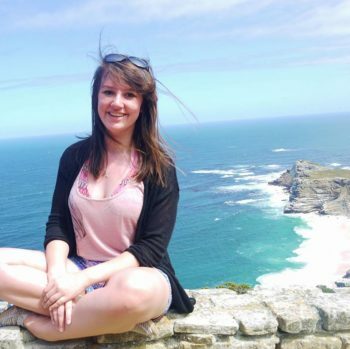 And Angelique Kurth, main organizer of this year’s SU revealed why this year it will also amazing. Golden Times: Your Summer University was one of the top three SUs in 2017. How did you manage this? Felix Goeke: For me organizing a good Summer University consists mainly of three key steps: First: Put up a realistic plan for a really great SU. Second: Find a team to do so. Third: Make sure you follow that plan. Golden Times: So what was your plan, the first step, about? Felix: The first step is the easiest. Everybody knows what a great Summer University needs, even though if it is a bit more difficult when you decide to do a Summer Course Plus SU with a German course on level A2/B1. 18 hours of German lessons per week is a big bumper for that what could be summer holidays on a travel SU. 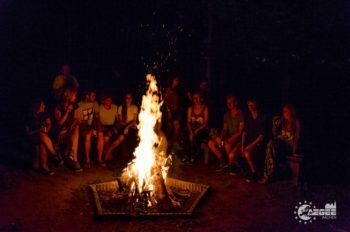 So we put a lot of fun activities around the German course: dancing lessons, parties on different locations, camping at a lake, visiting other cities and so on. The language course was extremely professional. Felix: We really had a very stuffed programme plan, some participants even complained that they don’t get enough sleep. We realized that in the second week where nearly everybody started sleeping on any spot as soon as they had five minutes free time. But hey SU also means getting out of your comfort zone. Our evaluation score proofed us right. Golden Times: I completely agree! So what about the second step, the right team? Felix: Step two is a bit more difficult. During the whole time we had 14 polar bears who wanted to be part of the organising team and we ended with a team of 11 organisers. At first I worried that we might lose the team spirit through some team changes, especially trough late joiners. But we’ve been such a great team that we all took a dancing lesson ourselves just one day before our SU started. I have to praise my team at this point! My two favorite meetings were: once when we chatted 20 minutes long before we started and drank a beer together afterwards before going home – during exams period! The second perfect meeting was when nobody had much time on that day and we finished the whole meeting in 40 minutes. Also very important: during the SU you have to build a team with your participants. 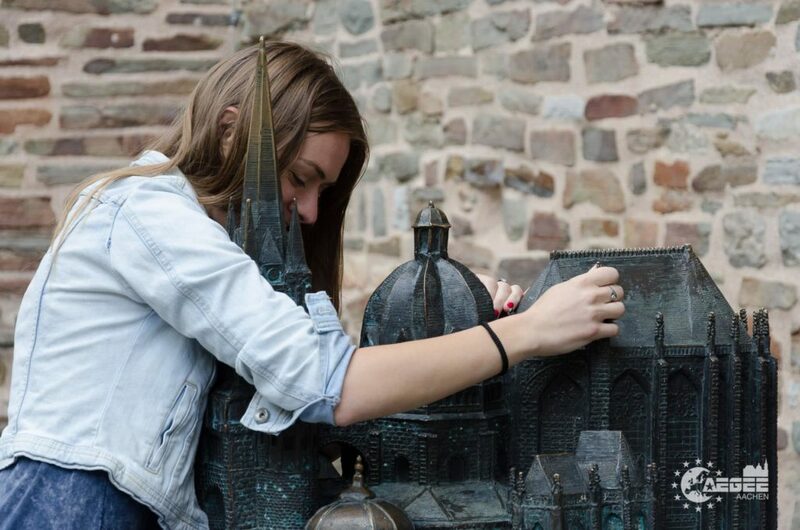 Come and fall in love with Aachen! Golden Times: How did you manage to achieve this unity? Felix: We planned with 25 participants and we had 26 applications. But we accepted just 21. Simply because we couldn’t see how the five we rejected could fit into our SU team. We knew that when someone writes he needs 10 hours of sleep per night, he’s simply wrong at our SU. Golden Times: What about the third step, the perfect plan? Felix: “A plan that cannot be changed is a bad plan.” “No plan, no matter how good it is, survives the first contact with reality.” These two sayings in mind, you know things will go wrong and that’s okay as long as you can manage. We had a good organization, nearly everything was written down on structured sheets. Not just online; I also always had a folder with me. Still, to keep your SU running as you planned it is actually the hardest part. It gets even trickier when your participants get tired, your hosts get sick, your helpers don’t want to follow the plan or when somebody simply forgets something. In the end we could solve every problem that appeared. Golden Times: Did your participants notice the adaptions of the plan? Golden Times: Thanks a lot for the great insight into last year’s SU. What’s the main topic of your Summer University in 2018? And why did you choose it? Angelique Kurth: Our focus will lie on our well-established language course since we want to cherish Aachen’s tradition of 30 years. 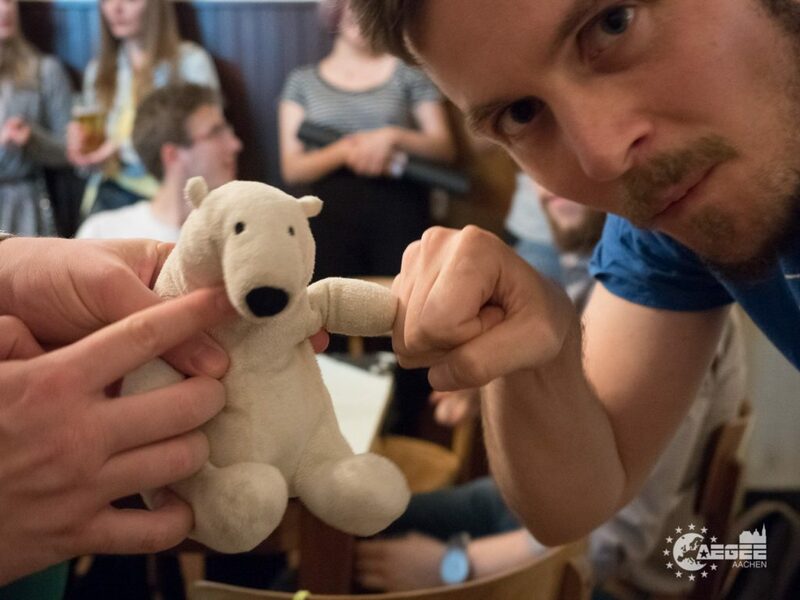 Also, as last year’s “extreme German” course was such a success, this year we want to make it even bigger and – most importantly – extremer, all with the help of our cuddly polar bear of course! Golden Times: Can you tell us more about the academic part of your SU? Angelique: Obviously for us the biggest academic part will be the language courses and workshops given by our experienced trainers and German teachers. Moreover there will be excursions to historically important places in and around our beautiful city where our participants will get to learn more about AEGEE, German culture and European goals. Golden Times: Let’s talk about the summer aspect of your Summer University. What are the three main programme highlights in this area? And which cities or landmarks will you visit? Angelique: Next to all this learning there will of course be a grand focus on the summer and fun part of our SU! The first weekend will all be about getting to know each other and we will do this in our picturesque neighbouring country Belgium. Our SU wouldn’t be complete without our legendary, Erasmus-proofed pubcrawl. Another highlight will be in the great city of Düsseldorf, where the local antenna will help preparing an awesome programme and where we will actually sleep in …drum roll… a church! Golden Times: What will you improve in your SU compared to 2017? Angelique: It is a pleasure to say that Aachen really stocked up on trainers so we will include some really professional workshops. Anyway it is an honour to step into the footprints of such a successful SU and we hope and are obviously positive that this year will be just as awesome, just a little extremer! Golden Times: Can you say a couple of words about your antenna: what makes it special? Angelique: AEGEE-Aachen was established 30 years ago. From then on we grew constantly, and today we count over 160 awesome members working on many projects. One of our biggest projects at the moment is the orientation week for Erasmus students coming to Aachen for the next semester and of course planning for the SU in full swing. But the most special thing about our antenna is definitely our famous and beloved polar bear, which cannot just be found in the Arctic Ocean, but in Aachen as well! Golden Times: Where can interested people find out more about your SU? Angelique: At the main Summer University page. A Facebook page will also be available soon, so stay tuned! Golden Times: Do you have a message to potential applicants? You meet see plenty of polar bears – big and small!